Dog dental hygiene is just as important as human dental hygiene. Unfortunately, dog’s dental health is sometimes overlooked. Many people seem to just expect dogs to have bad breath, and few people brush their dogs’ teeth frequently enough. Common symptoms of dog dental hygiene problems are often similar to humans: bad breath, blood in the saliva, broken teeth, drooling, loss of appetite, swollen, bleeding gums and yellow-brown tartar at the gum line. You should contact your vet if your dog is experiencing the more severe symptoms. Gingivitis is a gum disease that causes inflammation of the gum tissue. It can lead to periodontitis , bone loss and eventually loss of teeth. Periodontitis disease is the most common dental problem for dogs. It is caused by plaque (a mixture of food remnants, cell mucus, saliva and bacteria) and can be identified by a milky-white film on the gums and teeth. When mixed with saliva, plaque turns into tartar which cements itself to your dog’s teeth. (Note that plaque turns into tartar within 24-48 hours so frequent brushing is recommend.) It also eats away at the bone that holds your dog’s teeth by working its way underneath the gums. In advanced cases, infection can enter the blood stream, even causing kidney and heart disease. Tooth fractures are the second most common problem in dog dental hygiene. They are caused by simply biting down on something hard such as bones, sticks, rocks and some nylabone toys and can lead to infection inside the tooth (called endodontic disease). Avoid tooth fractures by buying appropriate dog chew toys. Discuss your planned teeth-brushing with your vet prior to beginning. If your dog has unhealthy gums or broken teeth, brushing may be painful and you should use gentler options. Wondering what parts of your dog’s mouth to focus on? Plaque build-up is most common on the upper teeth, so that is always the place to start. Dogs only produce plaque on the outside of their teeth and gum line, so do not worry about brushing the inside. At first, only briefly hold and look into your dog’s mouth – but do it often. Once comfortable with allowing you to look, start to massage the gums a little. Move in gentle circles around the outside of the gums and teeth. Do this quickly at first, and spend a little more time with each attempt. Now it’s time to introduce a brush. Let the dog taste the toothpaste before attempting to brush his teeth. Allow him to lick the toothpaste off your brush. When he has tasted the toothpaste, reapply paste to the brush and start brushing in a circular motion. Keep your dog calm and relaxed by praising him and stroking his neck area. When your dog is relaxed, pull back his lips and cheeks to gain access to the premolars and molars. Be patient – it takes some dogs over a month to get used to it. How long would it take YOU to get used to someone grabbing your face and putting something into your mouth? Depending on the individual dog, professional tooth cleaning is recommended every one to three years. This cleaning, which takes place under general anesthesia, consists of scaling to remove tartar above and below the gum line; polishing to smooth the surface of the teeth; and flushing to dislodge tartar and bacteria. The act of brushing a dog’s teeth twice weekly, while initially daunting, becomes easier with practice and routine. Caring for your dog’s dental hygiene will assure good dental health and prevent many more serious dental and medical problems as he ages. Ultimately you want your dog to get excited when the toothbrush comes out. Believe it or not, this can eventually be fun for them. So remember, be gentle, go at your dog’s own pace, and reward with a treat, trip outside, a game or whatever they like most. Dog toothpaste: Always use a specially formulated dog toothpaste. Because dogs can’t rinse and spit after a brushing, the paste must be safe for pets to swallow. Some human toothpastes contain detergents which can irritate pet’s stomachs, and, in addition, large quantities of ingested fluoride can harm pets. For small and medium sized dogs, we recommend Cain & Able – KissAble Toothpaste and Toothbrush combo to get your dog started. The vanilla flavored toothpaste is all natural and great for dogs. $11. For large dogs, we recommend using soft human brush (see below) and again the Cain & Able toothpaste is great for its all natural ingredients and flavor. 2. Dog toothbrush: Most dog dental kits contain a toothbrush and toothpaste sold together. If using a human toothbrush, pick a soft, nylon bristle, and, for a smaller dog, child-sized brush. Finger brushes can be purchased as well. These fit on a fingertip and allow owners easier access to their dogs’ mouths. 3. Chew toys: Dogs love to chew. Why not give them something to chew on that will also be good for their teeth? Nylabone toys reduce plaque build-up and massage your dog’s gums for good dental health. These long-lasting, rubber chew toys are flavored with real meat juices and designed to wear down slowly. Available at most large pet stores. 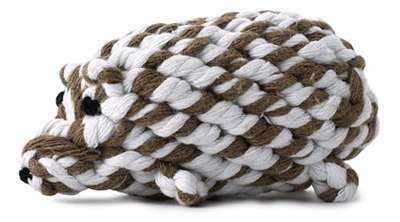 We recommend Doggles rope toys in a variety of animal shapes available at JasperandZoe.com. These toys are made from cotton thread and are hand tied. The rope helps to remove plaque while the pulling action keeps teeth strong. Proven to improve dental health and guaranteed to provide hours of chewing and tugging fun! 4. Teeth-cleaning or fresh breath treats: There are many good, healthy choices available for teeth-cleaning and fresh breath treats. Look for natural, organic ingredients as the healthiest option for your dogs. Tips for grooming your dog – courtesy of Dogchannel.com. 1. Match the brush to your dog’s coat type. Use a curved wire slicker or pin brush for long-haired breeds (such as Lhasa Apsos and Old English Sheepdogs), a regular wire slicker on medium or short coats with dense undercoat (Terriers, German Shepherd Dogs and American Eskimos), and a mitt or rubbery curry with smooth-coated breeds (Labrador Retrievers and Basset Hounds). 2. Spray on coat conditioner such as mink oil or other product before brushing to help loosen knots and tangles in long coats. 3. Brush and comb your dog before bathing. Tangles become tighter and more difficult to remove when wet. 4. Brush systematically. Professional groomers often begin with the dog’s hindquarters and leave the head and ears for last. The theory: If a dog can’t see what’s happening, he will be less likely to object. Develop a brushing pattern, and use it every time. You won’t lose your place or miss a spot, and your dog will learn what to expect. 5. Brush the entire coat down to the skin but do not brush the skin. Scraping the brush against your dog’s skin can cause “brush burn” — irritated, red skin that can require veterinary attention. Brush gently on tender areas, such as the tummy and inside the legs. 6. Concentrate on one section and one layer of the coat at a time. Part the coat by pushing it back with one hand and brushing the hair down a little at a time with the other. Use quick, deep strokes. 7. Take your time. Brushing out a coat, especially on heavy-coated breeds such as the Cocker Spaniel, can be hard work and time-consuming. 8. Comb after brushing to remove remaining tangles and knots. 9. Clip badly matted short coats and let them grow out.Spare your dog the pain and irritation of hours of detangling. 10. Praise and reward your dog. After all, this is a team effort! Get 12% Off All Orders Today on JasperandZoe.com! Let us make your day. Today only, take 12% off our already low prices on luxury, natural, and eco-friendly dog products. Offer ends at 12 midnight PST. Enter code Nov12. Shop now! Free Wagatha’s Organic Dog Treats w/Every Order Today! In honor of Veteran’s Day, JasperandZoe.com is offering free Wagatha’s organic dog treats with every order today! Today only, while supplies last. Shop now! Free Complete Natural Nutrition Dog Treat with Every Order Today! Happy Friday! JasperandZoe.com is offering a free healthy dog treat with every order today! Enter code FRIDAYTREAT at checkout. While supplies last. Visit www.JasperandZoe.com. Dogs love cheese and Complete Natural Nutrition’s Cheese Please is the healthiest and most wholesome way for them to enjoy pure cheese. It starts with real Wisconsin cheese that is produced with low salt and 99% lactose free and then crumbled and baked. Nothing else is added making it healthier than supermarket cheese. The result is mini crunchy-nuggets full of 100% natural goodness with only 3 calories per nugget. Cheese Please is an ideal treat for training or spoiling. And because Cheese Please can be easily crumbled, the smallest of dog breeds can enjoy the awesome taste of real cheese. For finicky pets that needs enticement during meal time, Cheese Please can be crumbled and mixed into kibble to create a dining delight. With no grains, no wheat, no corn and no soy, dogs with allergies can still enjoy Cheese Please.